The Children of George and Rebecca Leatherman. 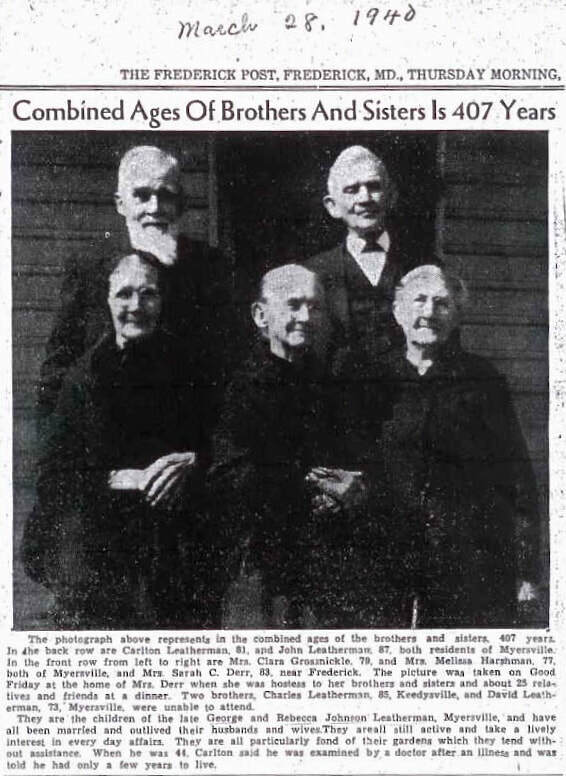 "Combined Ages of Brothers and Sisters is 407 years. The photograph above represents in the combined ages of the brothers and sisters, 407 years. In the back row are Carlton Leatherman, 81, and John Leatherman, 87, both of Myersville. In the front row from left to right are Mrs. Clara Grossnickle, 79, and Mrs. Melissa Harshman, 77, both of Myersville, and Mrs. Sarah C. Derr, 83, near Frederick. 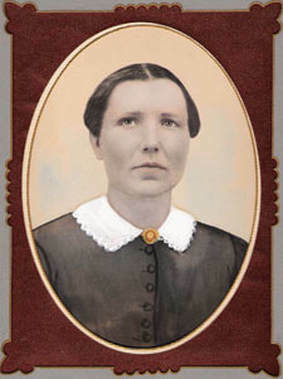 The picture was taken on Good Friday at the home of Mrs. Derr when she was hostess to her brothers and sisters and about 25 relatives and friends at a dinner. Two brothers, Charles Leatherman, 85, Keedyville, and David Leatherman, 73, Myersville, were unable to attend. A love letter from her suitor to Hannah -- who was in Benevolah, Washington County at the time -- still exists: "Aprile 25th 1855 ... John. H. Kuhn; His Love To Miz Hannah. C. Pryor; By these fiew lines I informe you that I am well at this time; And hoping that these fiew lines will finde you in the same state of helth; yet me an you are almost strangers; yet I will state to you that if we are almost strangers yet it is not said that we can not get acquainted if so your wish ma Be; And if my adreses are welcome to you Plese your honour I will heartiley Receive your answer to these Questions. As fare ase I know your friends [in Wolfsville] are all well at this time. As the Evening is short I will close these fiew lines And if to this question you will agree; Plese my Dear Miz and sende me an answer to Wolfsville Frederick County Maryland; Yours With Respect, John. H. Kuhn.' Courtesy Melody Hull. Jost or Yost, as the English write the name, was the youngest son of the Anabaptist Blickensderfer born at the Kohlof, in the Palatinate of Germany, 2 February, 1735. He came to America with his brother Christian, landing in Philadelphia 29 September, 1752, on the ship Rowand. Both brothers signed the declaration of allegiance to the king of England. Yost's signature read "Jost Blickensdorffer." Family lore says that Yost would not accompany his brother without being promised a rifle. Yost eventually settled in Frederick County and acquired a vast amount of land in the Wolfsville area, including "Jost's Claim," "Jost's Claim Enlarged," and "The Range Around Three Miserable Knobs." About 1766 or 1767, her married Elizabeth Ochs. She died circa 1781. He then took a second wife, Margaret Fuller, in 1797. Jost continued to live on his farm near Wolfsville and is buried there in a private cemetery, seen below. The Schenk family origins lie in Switzerland and then Germany prior to coming to America. When the family emigrated, they carried their possessions in a large blanket chest. Crafted of maple or light mahogany, it was fitted with two roomy drawers in the bottom part. As Schenk became Shank in the New World, this blanket chest became known as the Shank Chest. 7. Rev. Dr. Austin Donald Main, Sr. This Maugans family cemetery is located off Harp Hill Road. The stones have been removed but the Maugans remain. The first of this clan came from Germany to Pennsylvania in 1695. There were various spellings of the name: Maugins, Maugin, and even Morgan. Conrad Maugans was born in 1735 and researchers have found records of his father's death in the Wolfsville, Frederick County, and have thusly attributed Conrad's birth to the Wolfsville area. Who was Conrad Maugans? He was a man of determination and stamina. At some time Maugans owned a part of the land grants colorfuly names "I'll Take It All" and "Tom's Farewell." However there was another parcel of land for which he and another man were seeking a grant. Conrad walked all night to Annapolis to beat his competitor to it. When the other man arrived the next morning, he found Conrad at the Capital Building with the deed in hand. This parcel became the Maugans' homestead and was known as "Conrad Travels At night." Their log cabin stood over the spring. The Maugans Family cemetery is adjacent and the Conrad's remains still occupy the land for which he walked so far. On St. Cecilius Day, 22 November 1633, the fast and large ship, The London Ark and the smaller, slower ship, The Maryland Dove set sail from the Cowes, lower end of the Isle of Wight. These two ships were on an expedition to found the first Roman Catholic colony and the first of the English proprietary colonies in North America. On 25 March 1634, these two ships landed at St. Clements Island, Maryland. While there is no documented list of all the passengers on these two ships there is evidence that one William Browne came on The Ark as a man servant and shoemaker to Captain Thomas Cornwalys. He is believed to be between 10 and 13 years old at the time. William accumulated a large estate. He had many slaves and thirteen hundred acres of land. There are records of William being sued many times and of him suing others frequently. William Browne died 28 February 1665 leaving as heirs, a son and a daughter. In the 1720's, a descendant, William Browne moved to the Monocacy Settlement, where he served as constable. In 1742, this William Browne signed the petition for the formation of Frederick County. Thomas Browne was the 6th generation Browne and dropped the e. Brown was a corporal in the Second Maryland Regiment during the Revolutionary War. He married Hannah Pittinger and fathered nine children.Thomas died in the late 1780's and his burial site is unknown. Following Thomas's death, Hannah and their children built a home along Monahan Road south of Foxville. As the family grew the village became known as Brownsville. When Hannah died she was buried on her homestead which is now known as the Brown's Cemetery. Some of the foundation rocks from her old cottage are still intact there. Some of today's Myersville-Wolfsville generation can look back and find William Browne of 1634 there.